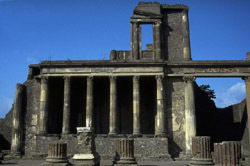 The basilica of Pompeii is dated at the end of the second century B.C. It is situated at the south west corner of the forum with the short side adjacent to the forum and measures 226 x 86 feet externally. The inner portico is formed by 12 x 4 colums and measures 150 x 42 feet on axes. This portico is surrounded by an ambulatory 19 5/8 feet wide. From the forum one entered a broad, plain lobby and from this climbed a flight of four steps to the main level of the building. From the middle of these stairs rose a line of four columns to carry the roof. The capitals are of tufa, Pompeian Ionic, carved into corkscrew volutes that are trimmed with palmettes carried on branches that curl back from the volute to bring the palmettes up to the abacus. The echinus is an egg molding of exaggerated plasicity, finished below with an stragal on a deep, plain collar above the top of the fluting. The abacus is a cyma reversa. The main hall of the building consists of a long columnar nave surrounded by an aisle. The columns were constructed of specially shaped tiles covered with stucco. There are no fragments of capitals of these columns but from their bases and fillets it is probable that these capitals were Corinthian. Along the long flanks of the surrounding aisle is an engaged Ionic order. This carried a Corinthian order in a second storey. The upper wall must have been pierced with large windows that flooded the interior with light. These made a clerestorey over the central nave unnecessary, and since there is no trace of any means of access to a gallery over the side aisles, it is very unlikely that there ever was one.